Thanks everyone for all the kind words! The internet attributes this quote to Thomas Edison, but after a little digging (very little), I can't find anything to verify its source. Regardless, it's a wonderful phrase and one that I wholeheartedly agree with. There's no such thing as talent, just people that work harder than others. I spent a lot of time banging my head against the desk, brainstorming (working hard), to come up with a concept for my poster. I eventually came up with the concept of "Hard work in a bottle." The idea being that one can avoid hard work with a just a sip of a special drink, the type you might find in a traveling snake oil salesman's wagon during the 1800s. So, my plan is to render the phrase as curative tonic bottle, with the phrase being the label. To reinforce the concept, I thought the type could be drawn in a victorian style, true to the timeframe- the industrial era- an time period synonomous with hard work. I've gone about the internet and my bookshelf and found some lovely examples/inspiration/reference. 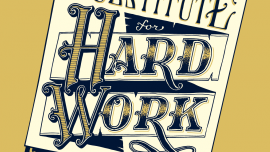 I've also been toying with the notion of adding an element to reinforce the idea of hard work. With the bottle, I have something that symbolizes a substitute, or quick solution, but I still need something to symbolize hard work. I considered using various inanimate objects, such as work gloves, boots, a uniform, or tools, but I think it would be better with a character. So after a little more brainstroming, I came up with the idea of illustrating an ant carrying the bottle. There's no other creature I can think of that works any harder or longer. Plus, the emphasis can still remain on the phrase. I think it could add a little humor as well. Any thoughts? Thanks everyone for the wonderful feedback! I ultimately decided to move forward with something along the lines of #2 or #4, then I played around with some thumbnail layouts. I also explored a few more letterforms. That lovely little "M" on the right is a sketch of a much nicer looking typeface found in an amazing book called Nineteenth Century Ornamented Typefaces. It proved to be a great source for some authentic inspiration. Thanks everyone for all the kind words and support! I really apprecaite the encouragement. I've gone ahead and drawn a much tighter comp of the bottle and label design. The word "substitute" still needs to be redrawn, but at least you can see where I am at so far. I plan on adding some ornamental details to the letters in the next version. Stay tuned. Hey all! Thanks for all the wonderful comments! I've been kind of busy lately with work so I haven't had a chance to make any more progress til this evening. Just a few more details to flesh out on this and then I can move onto inking. I just have a few more details to add to "Hard Work," then I can work on the bottle and ant. I've finished the lettering and details. Since I wasn't really sure what I wanted to do with the fill in "HARD WORK," I used tracing paper. I tried some stipplling and really liked the way it looked, so I decided to keep it. It actually looks really great by itself. So I plugged that in and now I'm trying to make everything work within the context of the label/bottle. I worry that, with the level of detail I have now, that placing the lettering inside a few containers (label, then bottle) may diminish legibility. I may just leave it as is, but I'd prefer not to because it doesn't quite convey the concept I had in mind. Oh well, I'll sort it out sooner or later, but this is where I'm at currently. Thanks for looking! I've gone ahead and digitized it - the quick and dirty method - and cleaned it up a bit. The outline on the word substitute was a bit much, so I've removed it. I've also started some color studies. I'm most fond of the blue and gold (A), but what do you think? Thanks everyone for all the wonderful feedback! And thanks Mary Kate for putting this class together. Your videos were awesome and the insight into your process has greatly benefited my own.